Read on to find out how to optimize for YouTube, the key ranking factors, and how to get your videos seen on Google too. You want to learn how to do something. This probably sounds familiar since, after Google, YouTube is the second most popular search engine in the world. 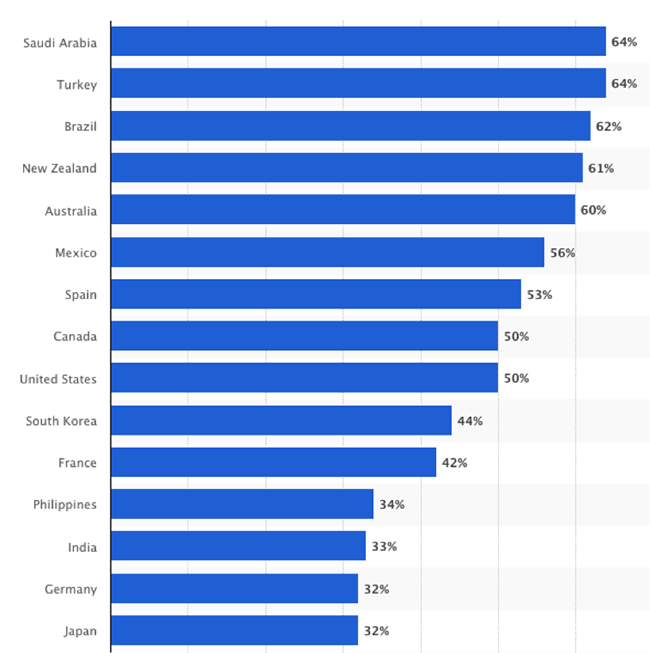 The numbers bear this out; in a 2017 survey, Statista found that over 90% of the US population has used YouTube to watch music videos or listen to music. And those numbers aren’t limited to the US either. As you can see in the chart below, millions upon millions of people watch YouTube on a daily basis. Here’s the biggest takeaway from those numbers: there’s enormous potential out there for brands. Are you ready to capitalize on that? Great, because in this post, we’re going to show you the basics of SEO for YouTube videos. Including why SEO matters for YouTube, where to optimize your videos, the ranking factors that matter, and how to get your videos seen on Google too. Many people have a basic understanding of how Google’s search algorithm works. You type in a keyword, and the results are what Google estimates are the best matches for your search term. YouTube works in a similar way. And, there is an excellent chance that many of your current or prospective customers are searching for keywords or terms that relate directly to your products or services on YouTube right now. If you can position your videos to capture some of these people, then you’re going to see a bump in not only video views but also subscribers, and even customers. When you think of YouTube as another search engine you can work to rank on, it’s going to open up the potential of getting your brand out there. So, let’s look at how to do just that. Now that you’re thinking about YouTube as a search engine, the next thing you want to do is understand the significant factors that help rank videos. In an extensive study of over 100,000 YouTube videos, Briggsby discovered a handful of factors that matter for ranking. When it comes to YouTube, whether you’re creating video ads or general content, viewability matters. Consistently, the videos that rank the best for particular keywords on YouTube are those with high view counts. It makes sense. As more people view a video, it signals to the algorithm that this video must be a good result for a particular keyword. So, it should go without saying, when you’re creating videos keep watchability in mind, and if you can, create your videos in HD. There are two mini factors within subscribes. The first is having people subscribe to a YouTube channel: clearly, that shows that the channel itself is attracting users with its videos. 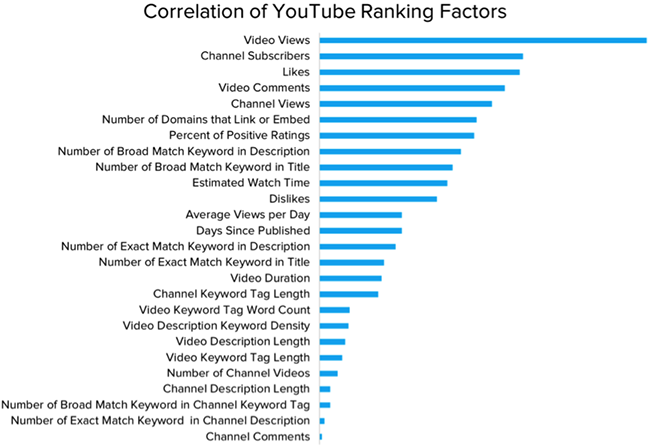 The second, subscribes after a video, is also important in YouTube rankings. It shows this particular video was so good or useful or entertaining a user was immediately driven to subscribe. We’ll cover more on how to ask people to subscribe later, so keep reading! This should be obvious; keywords are also a factor to ranking. You want to make your videos stand out by finding the perfect combination of keywords that are both unique and popular. One secret tip that Brian Dean offers: using the autocomplete feature in the YouTube search bar. 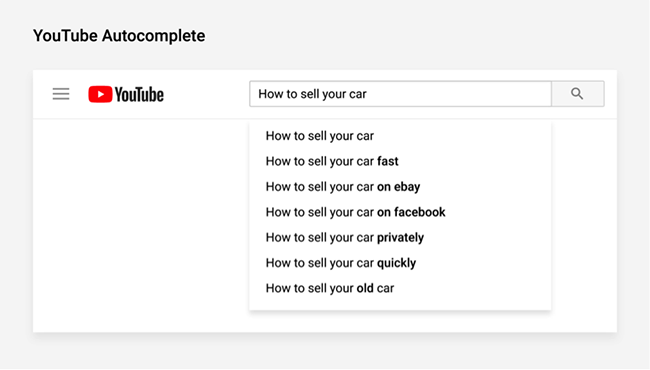 With YouTube, the autocomplete feature suggests the popular keywords that people are already searching on. So, it’s a big hint you can use to your advantage. Need help finding keywords? Check out Wordtracker's keyword tool. Creating content that generates comments is great on your blog, and it’s even better when it comes to YouTube. Video comments have been found to be a key ranking factor because they help to maximize engagement, something that YouTube encourages. 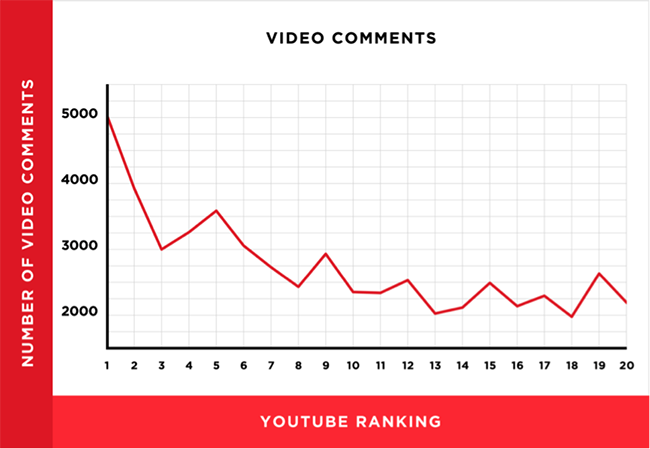 As you can see in the above image, there is a strong correlation between where a video ranks and the number of comments it has. For YouTube, likes is another indicator that a particular video has high levels of engagement. In the Briggsby study, the research found that while at first YouTube held view time as a key ranking factor, now in the spirit of favoring engagement, viewer satisfaction is essential. And that means having a higher level of likes to dislikes on your videos. Finally, there’s video duration. Both the Backlino and the Briggsby study have found that there is a positive correlation between video length and ranking. 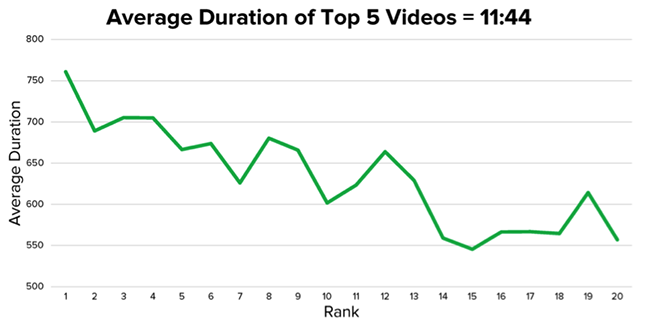 For the most part, longer videos tend to rank better. The people who are coming to YouTube to find answers to their questions or learn something specific will generally find a better answer in a 12 minute video over something that is just a minute or two. Now that you’ve got an understanding of some of the primary ranking factors for YouTube, let’s take a look at the things you can do to optimize your YouTube videos. Here’s the first thing to get out of the way, YouTube rankings do not necessarily correlate with Google rankings for the same keyword. A recent study from Stone Temple highlights just how much variation you can find between YouTube and Google. This study shows over half of the searches Stone Temple performed had different videos ranked first on YouTube versus Google. That’s a pretty big gap, and an opportunity for savvy brands to capitalize on optimizing their videos for both Google and YouTube. First, let’s focus on YouTube optimization. Doing a few of these tasks will help position your videos to get found by YouTube. Of course, the quality of your video is still going to be the most critical factor, but pay attention to grabbing the low hanging fruit where you can. Once you’ve got all of that covered, the next step is to work on ways to drive total watch time. These are small things you can do to keep people on your channel and increase your click through rates. First, add a thumbnail image to your video. Good thumbnails help attract people to your videos. YouTube’s Creator Academy has found that 90% of the best performing videos on YouTube have custom thumbnails. Canva is a great tool to use to create custom thumbnails for your videos. End screen cards help to increase interactivity on YouTube videos. You’ve probably seen these; they ask viewers to click to a new video or take a poll or subscribe or take some other action. These help to increase click through rates, again an important YouTube ranking factor, so you want to include these on your videos where you can. YouTube has a detailed video that helps you learn how to make these cards. TubeBuddy is a Chrome plugin that can help you optimize your end screen cards too. Now, remember where we highlighted that there are two ways to get your videos ranking for SEO, YouTube, and Google? You’ve got YouTube covered; now it’s time to learn some of the techniques you can use to get your videos ranking on Google as well. So, if your business creates any of these sorts of videos, you’re well positioned to start ranking on Google. The key here is to focus on Google’s ranking factors too, so you want to hit those importance relevance signals whenever you display your videos. As with ranking for any keyword, it’s going to take time and energy to drive people to your videos who aren’t finding them on YouTube. But, if you can work on your onside SEO with a focus on your videos, then you’ll be able to see gains in views and subscriptions by getting views via Google too. YouTube offers a ton of potential for brands who are willing to embrace it as a marketing strategy. With every video you create and optimize, for both YouTube and Google, you increase the chances of spreading your brand’s message and attracting more customers. 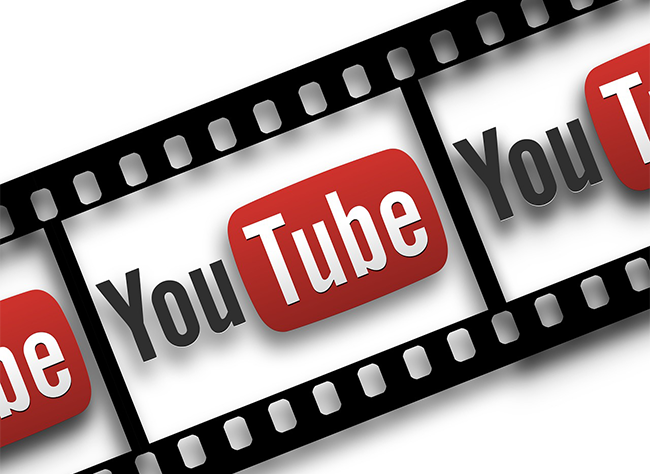 Have you had success with optimizing your YouTube videos for SEO? We’d love to hear them! Share your thoughts in the comments below. Tony Messer is the co-founder of UK web hosting company Pickaweb. Tony is passionate about helping other entrepreneurs and business owners create winning online strategies as outlined in his Amazon 5-star rated book ‘The Lazy Website Syndrome’. Prior to setting up his hosting business, Tony was an IT outsourcing project manager working on large financial services and government contracts in the UK and throughout Europe.